Amadou & Mariam On World Cafe : World Cafe Amadou and Mariam are two blind musicians from Mali who met, fell in love with each other's musicianship and became global Afropop sensations. The duo performs music from its new album, La Confusion. It's always kind of a miracle when two people find each other and fall in love. And that's what happened to my guests, the duo known as Amadou & Mariam. But their story is even more miraculous. They're both from Mali; they both lost their eyesight as kids — Mariam was 5, and Amadou was 16. 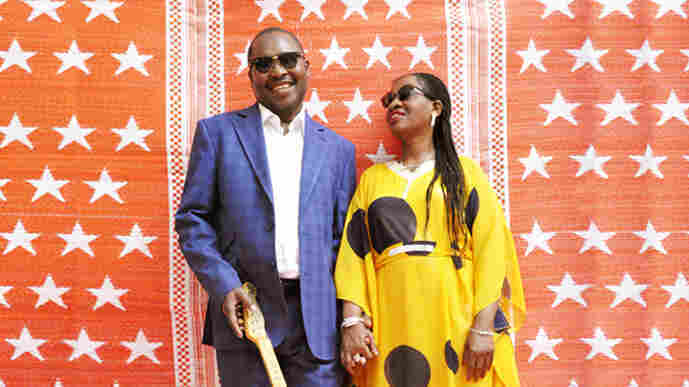 They met each other at the Bamako Institute for the Young Blind in the '70s, fell in love with each other's musicianship and went on to get married and become global Afropop sensations. They also have a lot of fans in the rock universe — they've opened for U2; they've been championed by Coldplay and Damon Albarn of Blur. And Amadou has a surprising guitar hero: David Gilmour of Pink Floyd. Amadou will play guest DJ for a hot second, and pick his favorite David Gilmour guitar solo. Today — with the help of a French translator — Amadou and Mariam will describe what each of them remembers about being able to see, and tell their love story. And, of course, we'll hear the duo perform live music from its latest album, La Confusion, starting with the song "Bofou Safou." Hear it all in the player above.